The Chauvet Circus itï¿½s a dazzling, ever-changing effect light with razor-sharp, flowing beams. Five separate, synchronized pods create amazing effects both in the air and projected onto any surface. The red, green, blue, white and amber LEDs provide a nearly endless combination of colors. 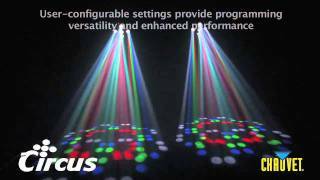 Considering purchasing the Chauvet Circus LED DMX 5 Lens Synchro Matrix Effect ? Have questions? Ask people who've recently bought one. 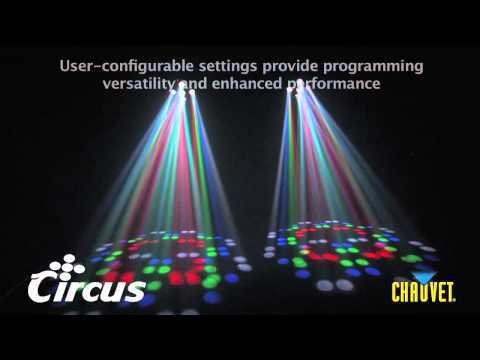 Do you own the Chauvet Circus LED DMX 5 Lens Synchro Matrix Effect ? Why not write a review based on your experience with it. Seen a video for Chauvet Circus LED DMX 5 Lens Synchro Matrix Effect online or have you own video? You will earn 292 loyalty points with this product worth £0.73, when logged in. Check out Chauvet Circus LED DMX 5 Lens Synchro Matrix Effect on DJkit.com!